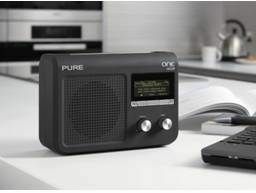 Pure has launched the world's most affordable 'connected' radio this week, a single portable that will let you access internet radio, in addition to all of your usual FM and DAB favourites. The Pure One Flow is the fifth member of Pure's One family and will cost £99.99 – a decent price for those who want to dive into the thousands of internet radio stations on offer. "One Flow achieves a new price in premium digital and internet radio, but it does so without compromise," says Colin Crawford, Pure's director of marketing. "So you get all the benefits of broadcast digital radio, plus new on-line content and you even get access to our revolutionary FlowSongs service to buy music direct from your radio. ONE Flow really will deliver internet-connected digital radio for everyone." Pure's One Flow will automatically hook up to your local home Wi-Fi connection to access thousands of internet radio stations and podcasts, as well as loads of BBC Listen Again content. You can also use Pure's Lounge service, which helps you save your favourite internet stations and podcasts. To go alongside this Pure recently launched a Lounge app for iPhone. Describing the look of the latest connected radio, Pure says: "With its luxurious, black satin-touch finish, satin-chrome dials and considerably enhanced audio performance, One Flow looks and sounds fantastic – and its intuitive interface including a new home button for easy navigation to the source menu makes it extremely easy to use. "One Flow is also an ideal travelling companion, providing up to 25 hours of portable listening per charge when fitted with the optional rechargeable fit-and-forget ChargePAK E1 (£34.99)." For more check out www.pure.com.